I can’t believe I haven’t updated in a MONTH! It’s been so BUSY around here. I barely know where to begin. We did a lot of field trippin’ because that’s what we do. 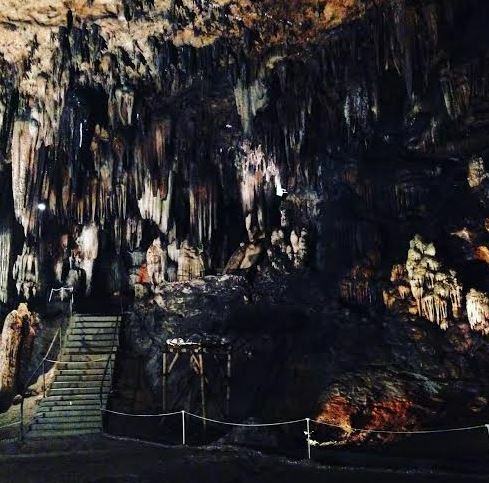 I love field trips. We also took our scheduled week off. That was nice, but starting back was HARD. So here’s a portion of what our last month has been all about. We made another trip to our local art museum. We love it! The picture in the top right corner is of BigG with his favorite painting at the museum – a Monet. I love that he has such an appreciation for art for such a young boy. 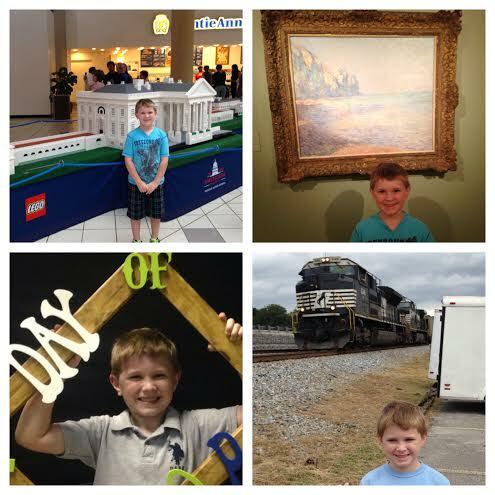 We got to see the LEGO Americana Tour. I found out about it almost too late but we made it. It was fun, awesome, amazing, and some other great adjectives. I mean, look at this. 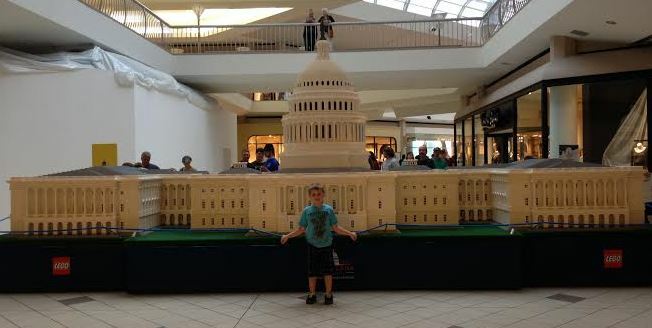 This is the Capitol Building built out of (an insane amount) of LEGOs! BigG is in front of it for scale (he’s 4 feet tall). Co-op started back. We love our co-op! It’s moved into a bigger space this year too because enrollment has really exploded. BigG is taking some great classes. He’s in building projects for the second time. (Think like woodshop but for little kids). This has been a fantastic class for him. He LOVES building. He’s also in Geography and a Magic Tree House Book Club class. In the spring I plan on us staying after lunch for more classes. We did four classes last fall and it was just too long of a day for him. So spring we cut down to 3. So when fall came around again I chose 3. He hasn’t taken afternoon naps since he was 3 but busy days tend to put him in a slump in the afternoons. But he’s grown out of that afternoon slump he used to get in so I think 4 classes will be fine in the spring. We also went to The Whistle Stop Festival. Which is a big festival held near a big railroad switching yard. Most people go for the food, vendors, music, etc. We go for the trains. There are plenty of them to watch. 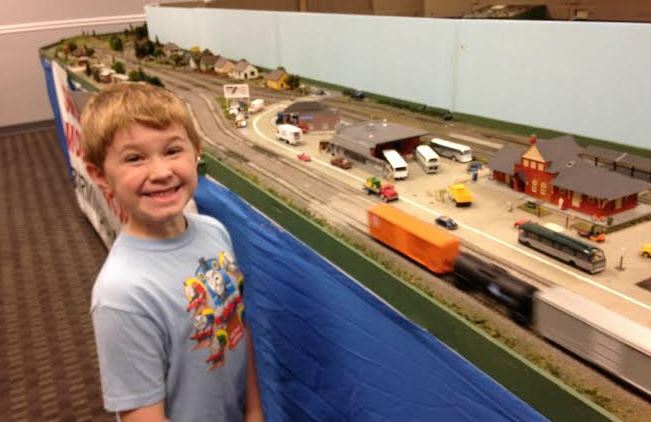 And a local model railroad group always sets up model trains inside the city hall building right next to the tracks. I mean, just look at that face! That’s how happy trains make him. Crazy boy. 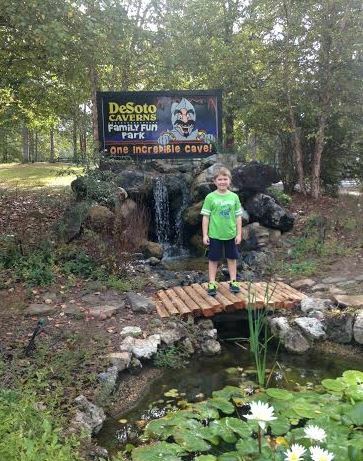 Oh, and we went to Desoto Caverns with our co-op last week (and we’re going to the Pumpkin Patch next week). That was super fun. I haven’t been since I was a kid. Even with all our trips to the zoo, art museum, science museum, etc, it’s nice to go somewhere new. And that pretty much catches us up. I promise to do better with the recaps! We just finished up Week 9 of our Sonlight Core A/LA 2 curriculum. We haven’t done anything terribly exciting with curriculum extras the last few weeks. 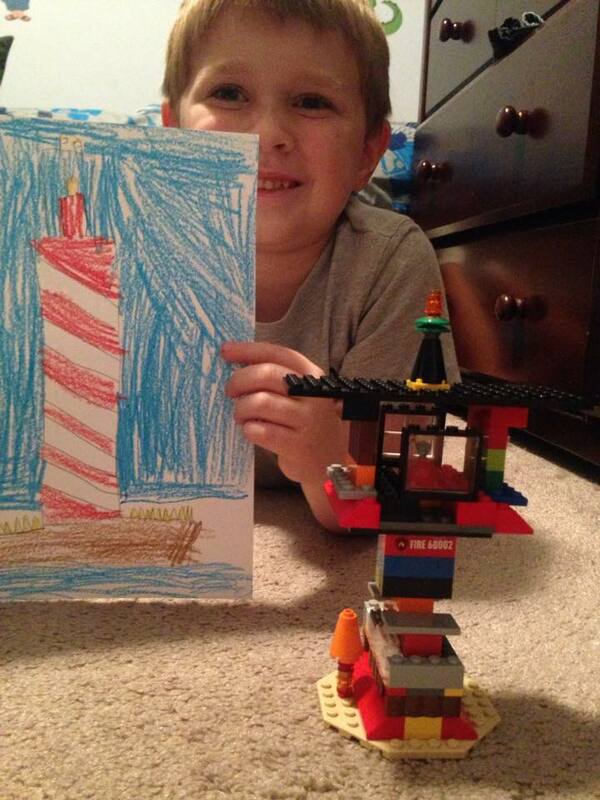 We did read The Light at Tern Rock and since BigG needs things for his hands to do during read aloud time he drew a picture of a lighthouse and built one with his LEGOs. We have one more week of school then we have our next scheduled week off, which just happens to be the week of BigG’s birthday!